Our electronic devices see a lot. Whether you're glued to your mobile phone, you work on a desktop computer or you like to occasionally use a laptop, you should probably think about giving it a clean every once in a while. 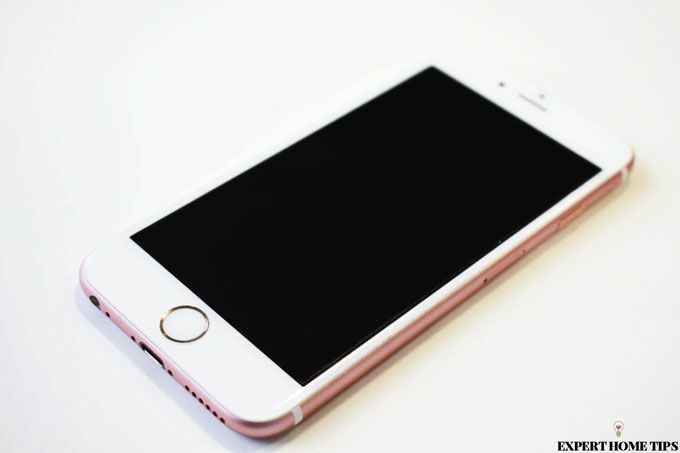 Grime and dust can actually slow down our devices and stop them from performing their best. When you've invested so much money in technology, you shouldn't let it go to waste. Today we're sharing some easy tips for getting your electronic devices looking as good as new. You'll be amazed by the results! For a thorough clean, remove the case. Most of the grime will be lurking on the outside of your case, so it's a good place to start. Depending on the material the case is made out of, you should be able to clean it quite thoroughly. You could either soak it in a solution of disinfectant and water or use an antibacterial spray or wipe to get it clean. If you leave your devices switched on and plugged into a power source, you could risk electric shock and damaging your device. Stay on the safe side and power down. Dust can easily build up in the jacks and ports of your device, where you plug in headphones and chargers. We'd suggest taking a can of compressed air and spraying directly into the holes. The dust and dirt will be propelled back out with the pressure. 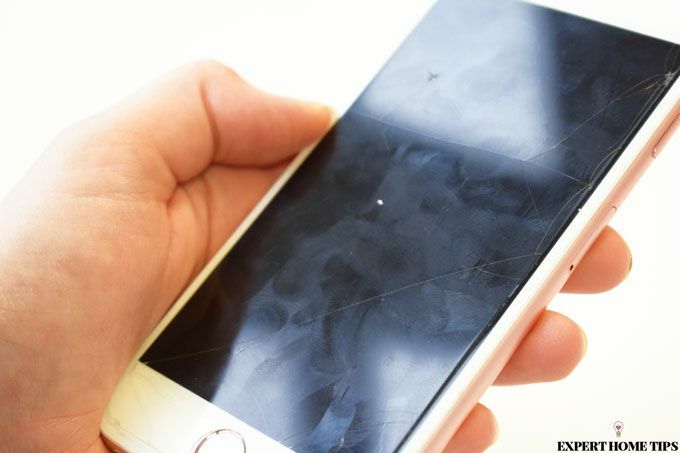 If it's time to replace your screen protector, now is a good time to do so. This step isn't essential, but it will help your phone look brand new. 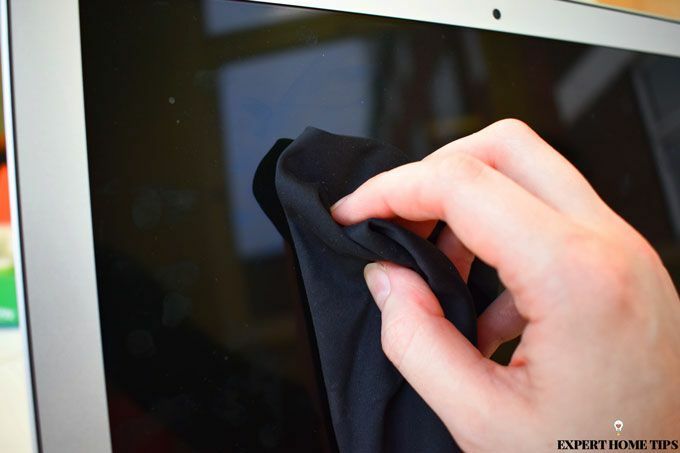 Use a dry lens cleaning cloth to wipe off any residue that might be on your screen. The kind of cloth that is used to clean glasses is perfect for this. Distilled water - tap water contains minerals and chemicals that will damage the screen. To make your own spray, mix together equal parts of the two ingredients in a spray bottle. Never spray the cleaner directly onto the screen. 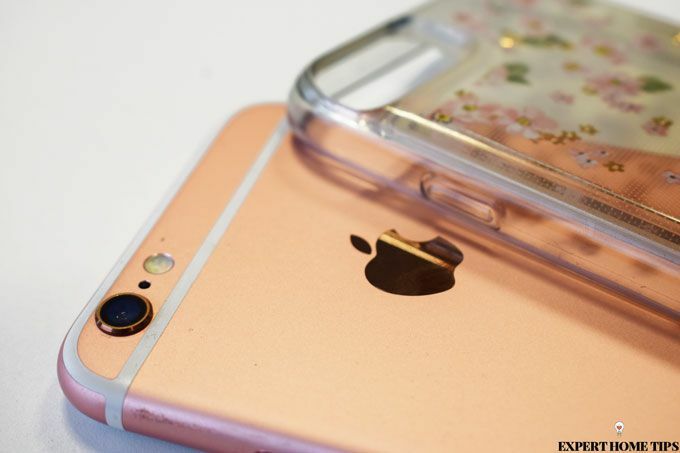 The liquid could end up trickling into places it shouldn't, potentially breaking your electronic device. Instead, spray the solution onto a microfibre cloth. Begin by wiping the screen with a dry microfibre cloth to remove any oils and grime. Then, take your cloth that has been sprayed with screen cleaner. You don't want the cloth to be too wet so wring it out thoroughly if it is dripping or too damp. Gently wipe the screen in a circular motion until it's sparkling clean. You don't want to press too hard or you could damage the screen. Spray the solution onto a microfibre cloth and then wipe the screen with the cloth. If you spray onto the screen directly, you could risk damaging your device with excess liquid. Turn your keyboard or laptop upside down so that the keys are facing down. Hold onto the device firmly and gently shake side to side, backward and forward. You should start to see bits of who knows what falling out. TOP TIP: You might want to do this over a bin or a bin liner to catch any mess. 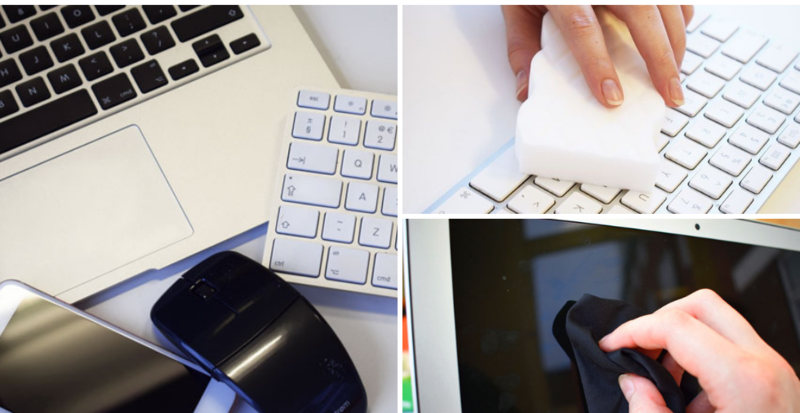 Magic erasers have so many brilliant uses, and one of them is cleaning keyboards! Gently rub a clean, dry magic eraser over the keys to remove any built-up grime and oil. If you have a keyboard like ours, be careful not to press too hard or you might scratch the metal finish. Using a can of compressed air is a popular method of cleaning when it comes to computers. Take care if you decide to clean your keyboard with air because the pressure can actually blow the dust further into your electronics instead of out. Turn your keyboard upside down or on its side and blow the compressed air in short bursts. Alternatively, you can use a small vacuum cleaner to gently remove dust. That's right! Cotton buds aren't just for ear cleaning. Use the fluffy end to clean in between all of your computer keys. You could use an alcohol-based cleaner to collect stubborn dirt, but be careful not to let the liquid drip down into the keyboard itself. 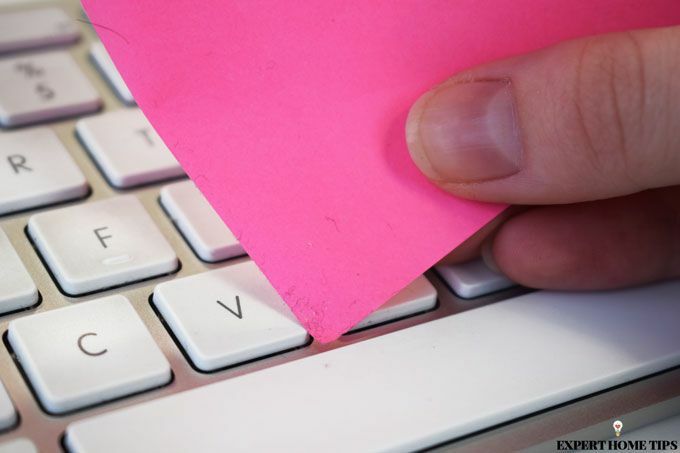 Did you know you can use a post-it note to remove dirt and dust? Take the sticky end and swipe it along all of your computer keys. It will pick up all the fluff and crumbs that have built up. You can use the thin edges to really get in between the keys too! 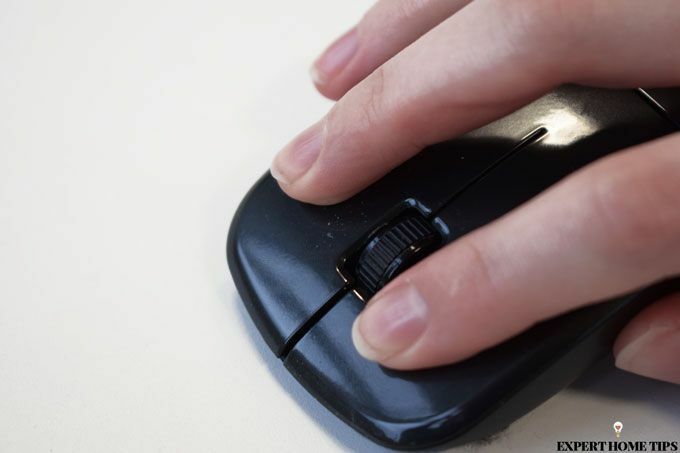 Imagine how many germs are hiding on your mouse! Begin by unplugging or switching off your mouse. You don't want to accidentally close an important document during the cleaning process! Use an alcohol-based cleaning wipe to remove any surface residue. Trapped dust will stop it working as well. Whether you have an optical or a ball mouse, you'll need to clean the base accordingly. If you don't clean it regularly, dirt and dust could get trapped and prevent the pointer from gliding as smoothly. For a mouse with a ball, you'll want to remove the ball and clean it thoroughly. 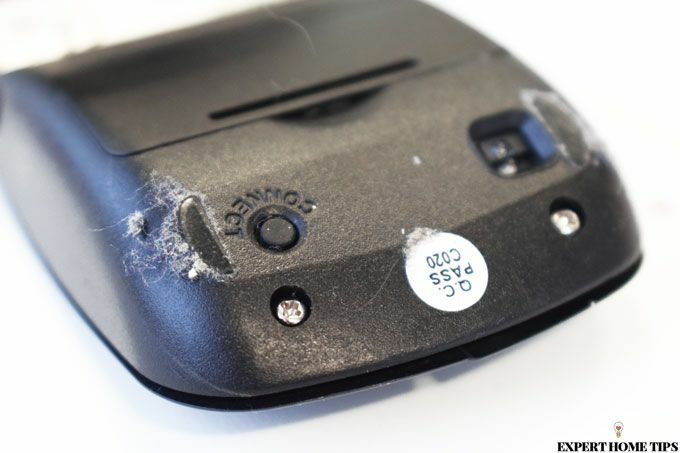 For an optical mouse, use a can of compressed air to dislodge any dust. When was the last time you cleaned your electronic devices? Let us know in the comments below! Don't buy distilled water - make your own by collecting water from melted ice cubes or defrosted fridge/freezer.